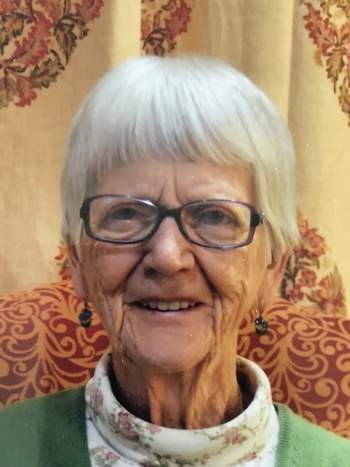 Lillian Cockrell Fenster, born July 25, 1923, to Linus and Ester Markuson passed away on Aug. 30, 2018, in Kalispell surrounded by family. Lillian grew up on the family farm north of Galata, Montana, with her eight siblings. She graduated from Geyser High School while being a nanny for Dr. Squire’s family. She attended Great Falls Commercial College. She married Marvin Cockrell in 1943 and had five children (She deserved a medal of honor). Lillian and Marvin owned Marv’s Grocery in Galata, until they moved to Kalispell in 1955. Marvin and Lillian enjoyed the Flathead. Camping, hiking, skiing (members of the Kalispell Ski Club), dancing and golfing — they both had gotten a “hole in one” on Buffalo Hill Golf Course. Lillian made sure all of her grandchildren had golf clubs and golf lessons. Marvin passed away in 1978 and she married Marion Fenster in 1981. Lillian and Marion shared the love of golf, playing cards and grandchildren. Even though, Marion had no grandchildren of his own, they were at all of the concerts, baseball and soccer games for their grandchildren. Lillian was preceded in death by her parents, eight siblings and both husbands. She is survived by her children, Ronald Cockrell (Cindy) of Great Falls, Dennis Cockrell (Jan) of Shelby, Vicki Cockrell Johns (Doug) of Kalispell, Cheryl Hatton (Doug) of Kalispell, and Debi Cockrell-Gilsoul (Rick) of Helena. Her grandchildren are Rodney Cockrell, Michelle Lavendar, Amber Braden, Kelsey McAlpine, McKeag Johns, Walker Hatton, Cooper Hatton, Spencer Gilsoul, Lili Gilsoul, Eric, Stacy and Ryan Smith, Kelly Johns, Janice Nelson, Kate Johns and Katie Hull; and 13 great-grandchildren. We would like to thank the staff at the Terraces, the Lodge, the Retreat and Home Options Hospice for the loving care they provided for Mom. Services will be at 11 a.m. Saturday, Sept. 8, at Northridge Lutheran Church, 323 Northridge Drive, Kalispell.